Delivered on April 7, 2018. My entire life, I have been told aphorisms like that. With Dad, a lot of times his sayings often told stories of places he’d been, things he’d seen, traumas to which he bore witness. When Dad asked us this, he was probably remembering the time he nearly froze to death during a blizzard in Colorado. He was there hitchhiking, seemingly aimlessly, though I’m sure he had some sort of purpose. If I recall accurately, the police officer who saved Dad’s life did so on the condition that he leave town as soon as the snow was over. After Vietnam, and before he settled down with Mom, Dad had a few police officers tell him to get out of town as soon as possible. See, for a time, like many other veterans, my father bounced around from place to place. He went on an odyssey across America: Colorado, California, Nevada, New Mexico. When he was hitchhiking in California in the 1970s, his sister, Ellen, found him along the Pacific Coast Highway and picked him up. What a strange coincidence – and what a happy reunion. In California, he once shared an apartment with two others in Laguna Beach. One Christmas, they had no money, but they wanted to decorate. So, being problem solving, creative men, Dad and his roommates stole Christmas lights that were on a nearby restaurant, adorning their little apartment with twinkling emblems of American commercialism. Dad was always quick to point out that they eventually returned the lights to the restaurant. I suppose in the strictest definition of the phrase “returned,” Dad was right. They returned them by surreptitiously throwing the strands of lights onto the top of the restaurant when nobody was around. While my Dad’s words were often reflections of his own life experiences, sometimes, my Dad’s words were just plain funny. And with that, we perfectly understood each other. To this day, Zach sleeps with his boxers on – always ready just in case something happens. What could possibly happen? A fire? An intruder? We don’t know. But, Zach’s prepared regardless. Speaking of fires, less than a year ago, Dad literally rushed into a burning house, courageously helping a neighbor quell a kitchen fire before the fire department arrived. One extremely dry Fourth of July, he also almost started a brush fire by setting off illegal fireworks. I remember that we kids were delighted at how the adults were both laughing and panicked at the same time, stamping out flames amid hoots and hollers. My father was many things, but most of all he was a good man. He taught us how to be men: to rise above challenges, to be responsible, to stand up to bullies, to protect the vulnerable, to live honestly, to reverse course when you’re wrong, to never back down when you’re right, to let your actions, not words, determine who you are. For over twenty years, Dad worked at a job he didn’t quite like at the United States Postal Service. What he did like about it were the people he worked with – and the solidarity that came with being part of a union. He was devoted to that job because it allowed him to be devoted to his family. It also allowed him to play “Mail Man Ken” each Christmas for preschoolers in the classroom Mom teaches at, dressed in a blue USPS uniform with a mailbag, taking letters from the kids to Santa Claus. While we didn’t have much growing up, we always had plenty thanks to Dad’s dedication and self-discipline. Dad relished his role as provider for us and, in particular, for our mother, his wife, Kathy. 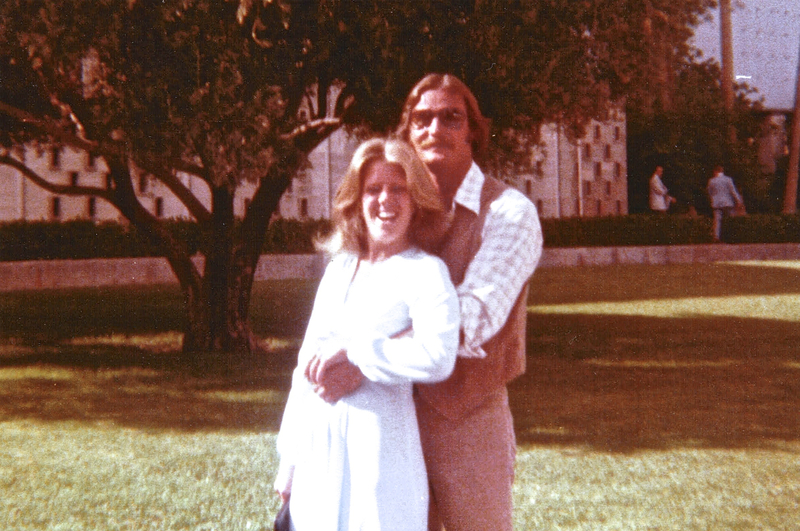 Their love story spans 40 years, and I believe it will continue because love doesn’t go away. It exists and is one of the few things that is unaffected by space or time. They always joked that their affair lasted much longer than they ever thought it would. They got married in Las Vegas. Dad always pointed out that he used a coupon to get a discount on the wedding. He kept that coupon for 40 years. 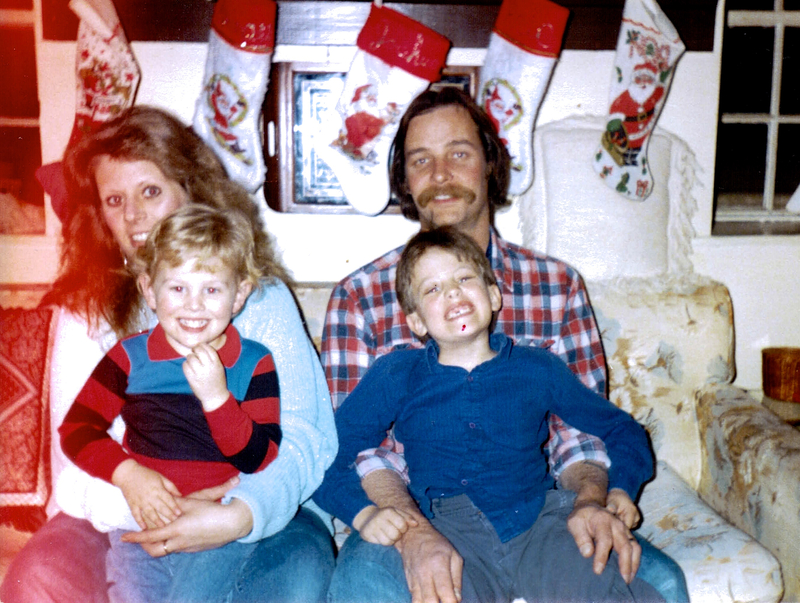 When he married mom, he married into a family, Mom and four-year-old Eric. He raised Eric alongside me and Zach as a son. He thought Mom was one of the most beautiful women in the world. And he often said so. As kids, we’d groan and roll our eyes. “How do you think you got here,” he’d say to us. About thirty years ago, defending my mother’s honor, and their right to watch Wrestlemania, Dad got into a fight with an overzealous wrestling fan at the Spectrum who kept holding up a sign obstructing their view of the stage. After the rude fan informed my father he had no interest in a peaceful resolution, my father corrected him. In the chaos of the fight, Mom joined in, picking up a watch that fell off the sign-holding villain’s wrist. She picked up the watch and threw it into the crowd – to really stick it to that poster board wielding fiend. They both said it was one of the funniest, and funnest, nights of their lives. We can all still do a really good Macho Man Randy Savage impression thanks to Dad. When we were kids, he was also known to run around the house in his underwear with a bath towel tied around his neck like a cape as though he were Superman. He was, at times, a bit difficult, too. But he was our goofy, difficult man. Later, with their three sons grown with their own lives, and when Dad retired, Mom and Dad became Ken and Kathy again full-time. Dad always said he wanted ten good years of retirement, and he got just about that. It was during this time that he got up early every morning to prepare Mom’s morning tea and start Mom’s car so it was warm and ready for her commute to work. They took trips together down the shore. They went to concerts. And, after decades of fighting the VA, Dad finally got the compensation he deserved. The camaraderie he felt toward his fellow veterans – Richard Parker and Paul Marcinko in particular – is something to behold. 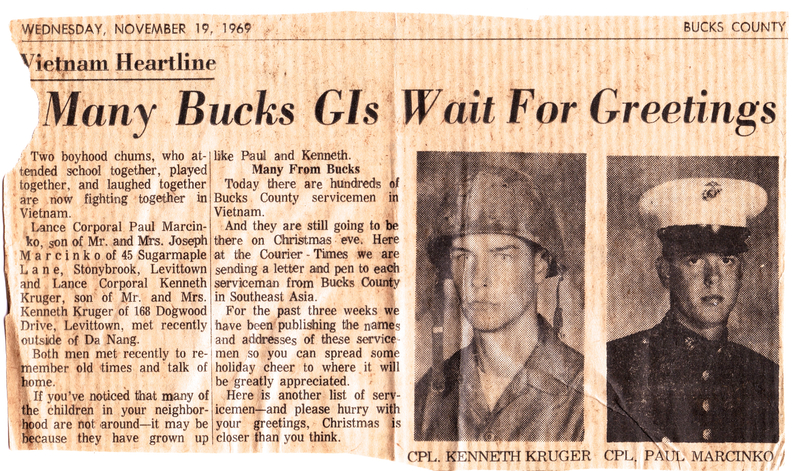 In 1969, the Bucks County Courier Times did a story on Dad and Paul, urging locals to write Christmas messages to the boys fighting over in Vietnam. In the article, he’s identified as Lance Corporal Ken Kruger. Once, after a long patrol in the jungle, Dad was ordered by a clueless officer to shine his boots. He refused. “What was the point,” Dad told us. The officer threatened to demote him. Dad did not care. He told us that he never regretted refusing that ridiculous order. After his service, he still received an honorable discharge – with his stubbornness still intact. 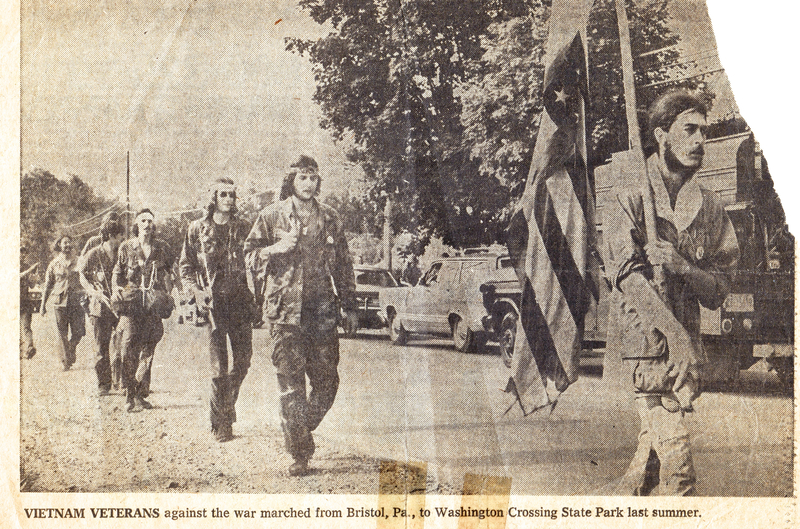 The local newspapers again covered Dad when he came back from Vietnam, this time when he protested with Vietnam Veterans Against the War. So, when Dad retired, and when he won over the VA, he truly relished it. It was also in retirement that Dad fully transitioned into the role he was preparing for his entire life: as grandfather, or “Poppy,” to Zach and Maggie’s son, Adam, and Eric and Carolyn’s daughter, Addie. When he became a grandfather, Dad seemingly finally felt at ease to let his sensitivity and gentleness show publicly. He often tried to hide his sweet nature, but the love of being a grandfather was simply too much for him to obfuscate with that steely Marine Corps stubbornness we were so used to. 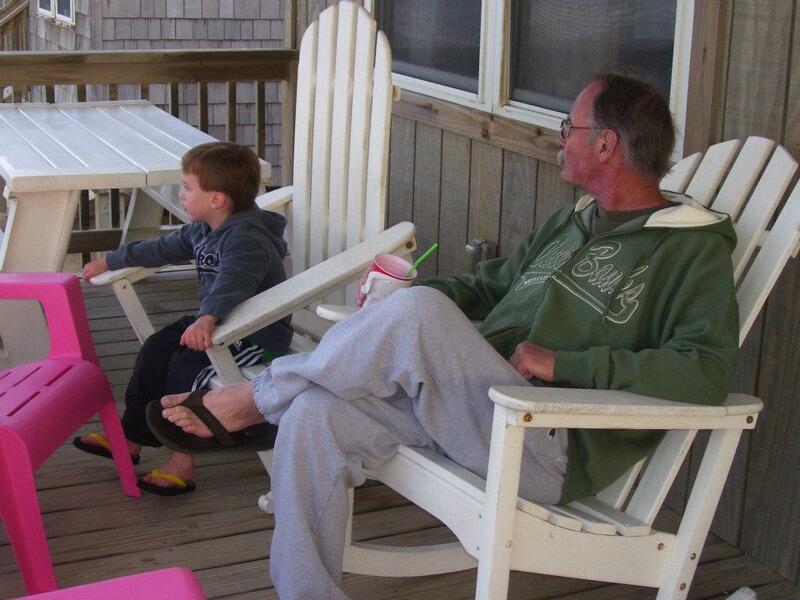 He adored being a grandfather. 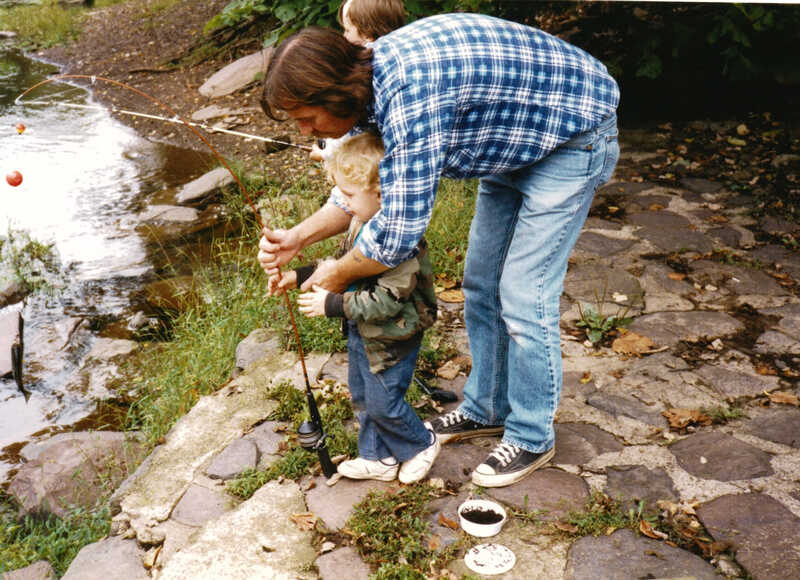 For years and early in his grandson’s life, Dad spent nearly every day with Adam. When Addie visited, he would make breakfast for her, spending mornings with her as Poppy. He often channeled the sensitivity and gentleness of his mother, Erma, whom he also adored. 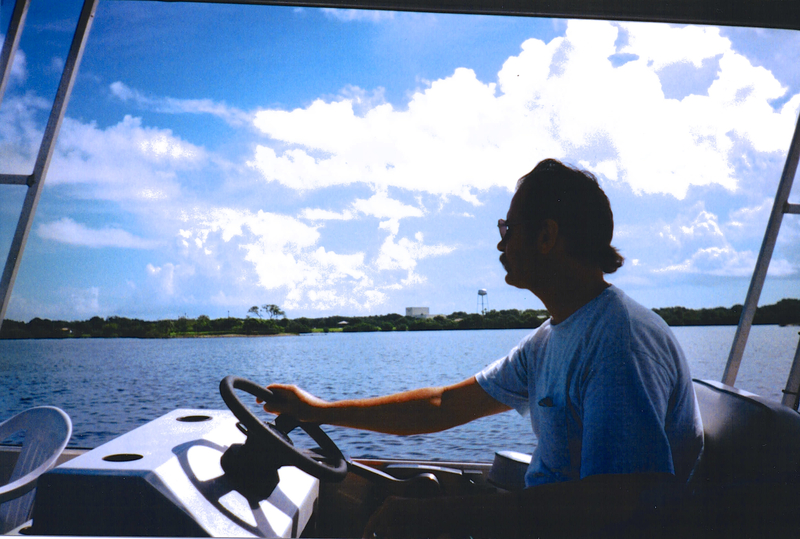 My father was one of the most deeply sensitive, and yet also practical, men I have ever met in my life. 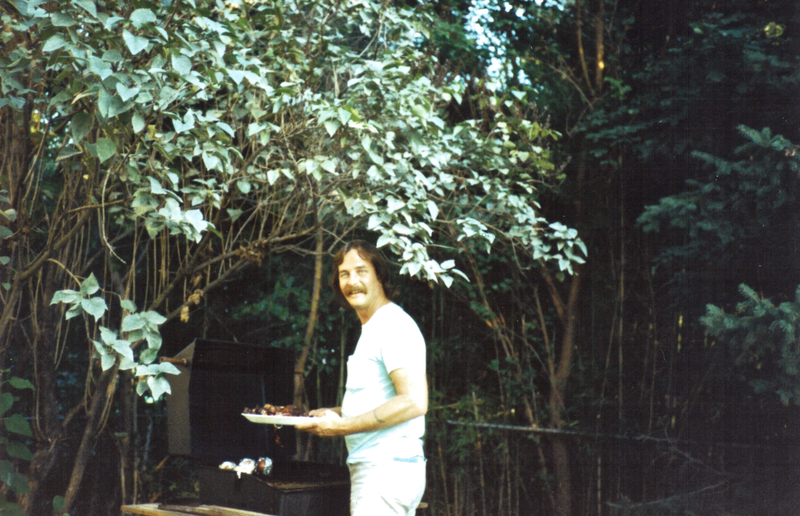 His respect for nature and the inherent dignity of all human life shows through in his lifelong actions: his support of workers, his belief in protecting the Earth, his love of animals, his gardening, his preservation of family land he purchased in central Pennsylvania so we’d always have a homestead and campsites, his constant, and sometimes even inappropriate, good humor, and, of course, his devotion to his wife. That devotion wasn’t just in the small things like the morning tea. Dad worked diligently for years to ensure that Mom would be OK even if he weren’t around anymore. Our whole lives, Dad, being sometimes too practical just like his own father who was also named Ken, told me and Zach about that, telling us where the important information was and what we had to do if things ever got to that point. Then, one day, suddenly and completely unexpectedly, things got to that point. And, at that point, we were able to be with him, all day, every day, holding his hand, telling him we loved him. Despite the traumatic circumstances for us in the end, circumstances that would smash anyone into countless emotional fragments, we came together as a family. Our hearts were breaking, but we were united in love – for Dad and each other. And, we did everything exactly as Dad wanted. 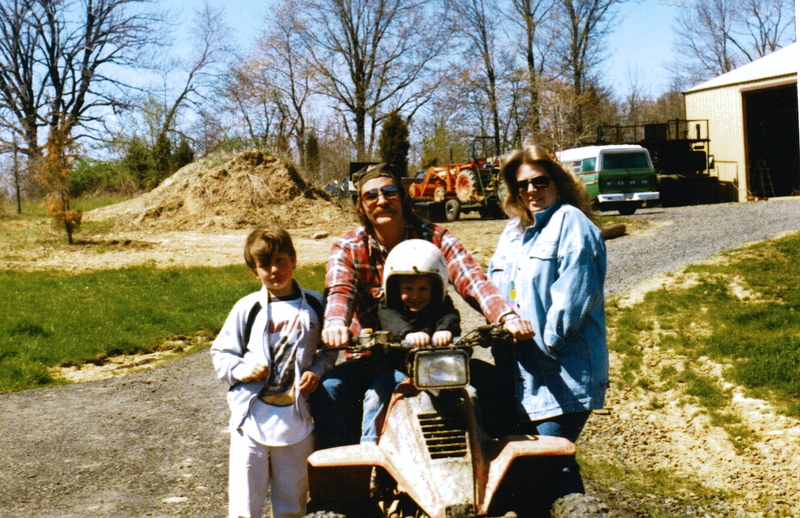 Still, one of the hardest things we had to do as a family was let Dad go. The day before he died, it was snowing. We drove to the peaceful place Dad spent his last days, and we again stayed with him all day. There were no loud hospital machines anymore as there were the week prior. Instead, there was a stillness. And it was the kind of place Dad would want to be at in the end. After he died, we had a lot of work to do. Zach and I swung into action, making calls, filing paperwork, protecting Mom as best we could. Our actions, integrity, and, if I may say so, our grace during this time is a testament to the character that Dad built in us. We had no idea the men we could be, or the men we had grown into. He was always willing to help us, to give us second, third, fourth chances if we helped ourselves and did our part, too. It is now clear that Dad was training us just as life, and maybe even drill sergeants, had trained him. One of the last tasks we had to do was provide the pictures you see here today for the memorial. If you take a look at these pictures, you’ll notice something. That is, Dad was always there. Behind us teaching us how to fish, with his hands around Mom’s waist, at the beach setting up camp in a good spot for the whole family before we woke up, at weddings, at births, at graduations, at high school plays, on vacations, at home, at Christmas, at every important moment and every opportunity to love us, Dad was there. When he wanted to be there, Dad was there. Even when didn’t want to be there and he would rather be at home, Dad was still there, too. It is a blessing to have had such a father, a friend, a brother, a colleague, a husband. And, while that is true, the fact remains that sometimes we are nonetheless blessed with good things and good people. That is, in part, why this loss is so hard for so many of us. The emotional cut is so deep that, while it will surely heal with time and love, the scar will always be there. Yet, my father’s legacy will be one of a courageous, compassionate man with an exceptional life story, unparalleled integrity, countless friends, and a family that loved him. I will miss him more than I have ever missed anyone or anything in my entire life. And I know I am not alone in that. And while Dad won’t be in pictures any longer from this point forward, his legacy, and the people he influenced and the family he created, will endure. What a legacy it is to be remembered – and truly, dearly missed – by those who love you. And, what a legacy it is to be remembered because of love.